Olivia Mehaffey should make a significant move in the World Amateur Golf Rankings after she birdied the second extra hole to complete a sensational hat-trick of wins in the Irish Girls Open Strokeplay Championship at Roganstown Hotel and Country Club. Three strokes behind Austria’s Isabella Holpfer entering the final round, the Royal County Down Ladies' star made two birdies and two bogeys in a closing 71 to set the target of five over 218 that was matched by England’s Samantha Fuller, who birdied the 18th from 10 feet for a 72. The pair ended up in a playoff for the title as Holpfer crashed to a 79 featuring one birdie, three bogeys, a double and a triple bogey and ended up in 11th place on 10 over. Hermitage’s Ciara Casey birdied the 18th for a 73 and excellent third place finish on seven over while Killarney’s Mairead Martin carded a 76 to claim ninth spot on 222. Forrest Little’s Julie McCarth also finished inside the top 20 with combined rounds of 74, 74, 79 (227) good enough for 15th place. The International Team Event was dominated by Sweden (Beatrice Wallin, Linn Grant and Els Lundquist) as they finished on a total of 441, one shot clear of both England and Scotland (442). The Irish team carded a combined total of 445. 189 Carlotta Overheu (GER) 98 91. Olivia Mehaffey is three off the lead with a round to go at Roganstown. Olivia Mehaffey will have to come from behind if she is to complete a dream week with victory in the Irish Girls’ Under 18 Open at Roganstown. 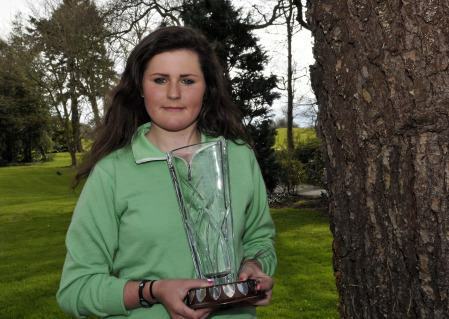 Killarney's Mairead Martin is the leading Irish player heading into Sunday's final round of the Irish Under 18 Girls Open Strokeplay Championship at Roganstown.